Chapter 2 has reviewed the key results of waveguide theory, particularly with respect to the various optical modes that can exist in the waveguide. A comparison has been made between the physical-optic approach and the ray-optic approach is describing light propagation in a waveguide. 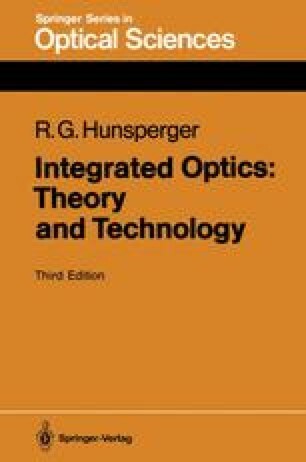 In this chapter, the electromagnetic wave theory of the physical-optic approach is developed in detail. Emphasis is placed on the two basic waveguide geometries that are used most often in optical integrated circuits, the planar waveguide and the rectangular waveguide.